How Do I Add a Second Email Account in Google Apps? Google Apps users have an advantage over standard Google account holders - the ability to create multiple email accounts within the same domain! Google Mail has become an extremely popular email solution, accessible via a web browser, mobile device and even in a desktop email client. The flexibility of the service and the vast storage means that more and more people sign up every day, and this popularity has led to it becoming a key aspect of Google Apps. If you’re using Google Apps, you have probably setup the account to use your own web domain as the email address. This means that you can control various aspects of emails to and from your domain, as well as how they are accessed and read. So why would you need to setup an additional email account in Gmail? You might, for instance, be planning to add a new email account to your domain for use by a new employee, or to filter messages for a particular purpose away from your main email account. This account would then be accessible only by the new user, who would be able to use the same account to access other services such as Google Docs and their own iGoogle page. Note that there are some downsides to this, however. The owner of the second email account might find that they will be unable to automatically login to an existing Google account, and if they use an Android mobile device switching to the new Google Apps email account will more than likely result in frustration rather than a great new world of mobile working. 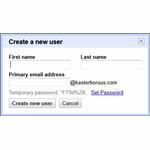 Setting up a new email account in Google Apps is pretty straightforward, but note before you start that you will need to have access to the administrator login details. Proceed to sign into the account as normal (typically via mail.DOMAINNAME.com) and then go to Manage this domain. In the next screen, select Organization & users where you should see a list of existing users for the domain (at this stage, if you’re adding a second email account to Google apps, only the administrator account should be listed). To proceed, click Create a new user and then enter the First name and Last name of the intended user, and enter a Primary email address. By default a temporary password is assigned, although you can circumvent this via the Set Password link. Once you’re done, click Create new user, and the account will be setup. Confirmation of this will be displayed, as will a signup link. 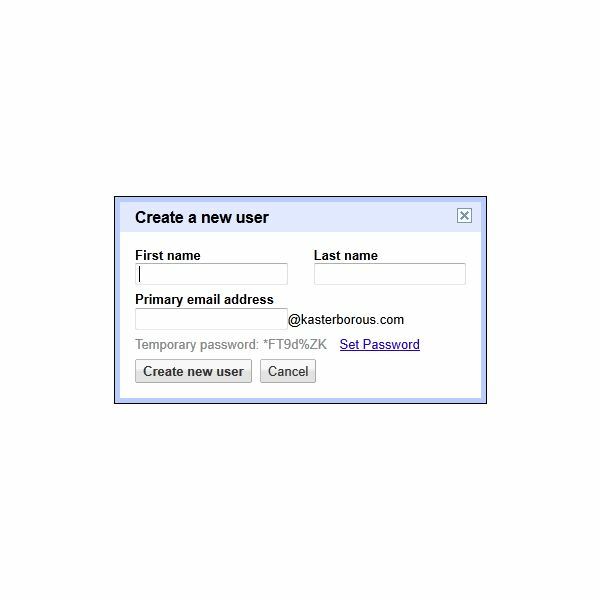 Proceed by clicking Done or if you have more accounts to create, use the Create another user button. Once an account has been setup, the user should be able to access it via Gmail in the usual way – simply open mail.google.com or mail.DOMAINNAME.com and enter the email address, and this will open the email inbox. From here, the user will be able to send and receive emails and generally use their account in the same way that they might use the standard Gmail. Via the Organization & users tab you will be able to select users to apply More actions, such as Rename user and Delete user; the More actions drop-down menu also offers the ability to Bulk upload users or Download as CSV. The bulk upload option requires you to create a spreadsheet in CSV format, with the email address in the column A, first name in column B, last name in column C and the password in column D. The CSV document should also include a row of headings, as specified above. With the Google Apps suite you can create up to 10 users with the standard free account, or many more if you have a business account. If access email in a web browser isn’t ideal for the user concerned, there are various other ways to send and receive messages, from mobile apps to desktop email clients. This is particularly useful if the Google Apps email account holder is ever going to have to forward multiple emails to another user as this function isn’t available in the Gmail view. To find the appropriate account setup details for your email client, sign into the account and click the cog button in the top-right corner; from here, select Mail settings and then Forwarding and POP/IMAP. Whichever option is select here as the account type, you can then use the Configuration instructions link to find out the best way to setup your preferred email client.